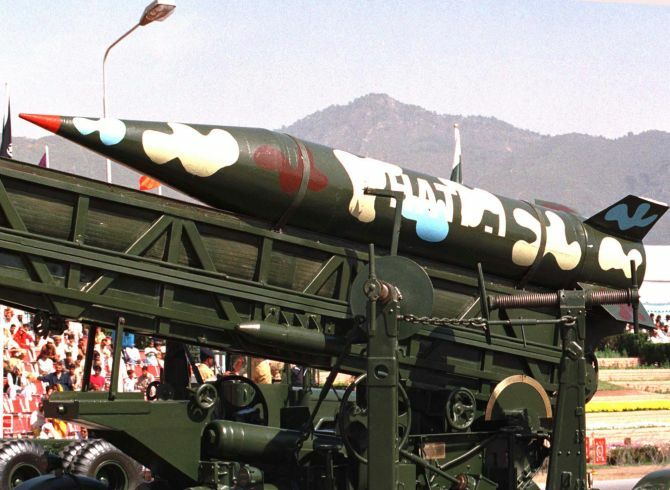 In an unprecedented deal, China has sold Pakistan a powerful tracking system which could speed up the development of multi-warhead missiles by its all-weather ally, the state-run Chinese Academy of Sciences said. Zheng Mengwei, a researcher with the CAS Institute of Optics and Electronics in Chengdu, Sichuan province, confirmed to the Hong Kong-based South China Morning Post that Pakistan had bought a highly sophisticated, large-scale optical tracking and measurement system from China. "We simply gave them a pair of eyes. They can use them to look at whatever they want to see, even the Moon," he said. Zheng said he could not elaborate on the technology nor where in Pakistan it was being used as it involved the country's defence interests. He, however, said that the Pakistani military recently deployed the Chinese-made system "at a firing range" for use in testing and developing new missiles. China was the first country to export such sensitive equipment to Pakistan, the CAS said. The Post report attributed the sale of the equipment to Pakistan to India testing the most advanced nuclear-ready intercontinental ballistic missile Agni-V with a range long enough to hit Beijing or Shanghai. Chinese authorities declassified information about the sale of the tracking system on Wednesday. While India's single-warhead missiles are bigger and cover longer distances, Pakistan has focused its efforts on developing multiple independently targetable re-entry vehicles, a type of missile carrying several nuclear warheads that can be directed towards different targets, the report said. The United States Defence Intelligence Agency officially confirmed in March that Pakistan conducted the first test launch of its nuclear-capable Ababeel missile in January 2017, "demonstrating South Asia's first MIRV payload", it said. But outside Pakistan, military experts believe that it will take much more time before the Ababeel missile is ready for use in battle. It is thought to be still at an early stage of development, with plenty of room for improvement. China has been the biggest supplier of arms to Pakistan which included ships, submarines and fighter jets. The Chinese team which took the tracking system to Pakistan enjoyed VIP treatment during the nearly three months stay to assemble and calibrate it and training technical staff, the CAS statement said. "The system's performance surpassed the user's expectations," it said, adding that it was considerably more complex than Pakistan's home-made systems. The report did not reveal how much Pakistan paid for the system. An optical system is a critical component in missile testing. It usually comes with a pair of high-performance telescopes equipped with a laser ranger, high-speed camera, infrared detector and a centralised computer system that automatically captures and follows moving targets. The device records high-resolution images of a missile's departure from its launcher, stage separation, tail flame and, after the missile re-enters atmosphere, the trajectory of the warheads it releases. "The uniqueness of the Chinese-made system lay in its use of four telescope units, more than normally required," Zheng said. Each telescope, with a detection range of several hundred kms is positioned in a different location, with their timing synchronised precisely with atomic clocks. Together, the telescopes provide visual information of unprecedented detail and accuracy, which missile developers can use to improve designs and engine performance, the CAS said. Using more telescopes allows the system to track war heads simultaneously from different angles, reducing the risk of losing a target. High-quality optics are essential in missile development, especially MIRVs, said Rong Jili, deputy director at the Beijing Institute of Technology's School of Aerospace Engineering. Other types of tracking devices, such as radar, can collect more precise data at longer distances, but the Chinese-made optical system provided the intuitive, close-up look at real-life action that missile developers craved, he said. Unlike the US, which accounts for one-third of exports and supplies to at least 100 countries, China delivered major arms to 44 countries, mostly in Asia and Africa. More than 60 per cent of China's military exports went to Pakistan, Bangladesh and Myanmar and another 22 per cent went to Africa, according to a recent study report by the Stockholm International Peace Research Institute.